Developing a prevention plan per individual is an important part for our dentists’ at Skygate Dental. It is one thing to place a filling, but the more important issue is to identify the underlying risk and prevent the cavities from occurring. After a thorough clinical examination, a full risk assessment will be preformed for each patient. In terms of general prevention, it is important to brush and floss twice daily. Each plan is unique and it is important to tailor a patient’s plan, per an individual needs, our dentists at Skygate Dental will discuss risk and prevention at check-up and cleans. Quite a common question that is asked: “Is which tooth brush is better a manual or electric?” This has actually been studied in clinical trials and for the most part it was found that both are actually pretty close to the same with the exception of one electric brush which proved to be marginally better. Thus, a very important factor in brushing is to make sure it is done properly and effectively. Further, often patients will find that electric brushes provide a better clean and the benefits of the movements aid for a better overall clean; however, the same level of oral hygiene can be achieved with a manual brush. (High Risk Individuals). Further, only for individuals older or greater than > 6 Years Old. Not a substitute for brushing, not to be swallowed. (High Risk Individuals). Further, only for individuals older or greater than > 10 Years Old. Not a substitute for brushing, not to be swallowed. (Not Applicable )-> No longer advocated -> High risk of Fluorosis. Moreover, little evidence of benefit if there is optimal drinking water (fluoridated). (High Risk individuals). A stronger fluoridated toothpaste can be beneficial. 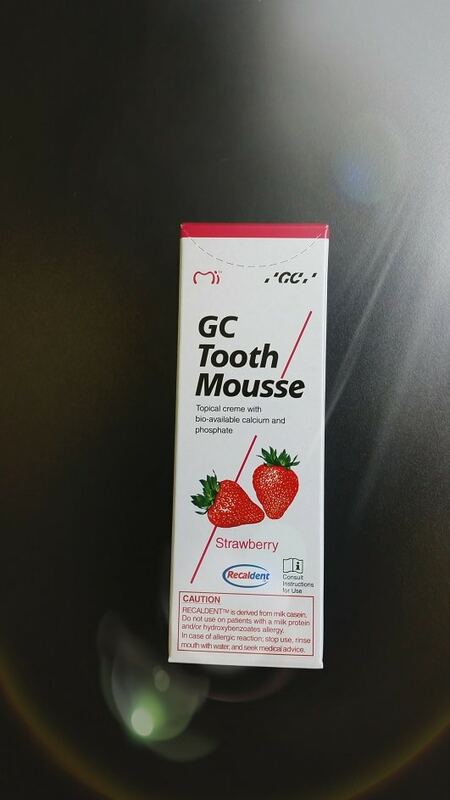 Tooth Mousse is an oral health product that is used to help protect teeth. It contains a special peptide (derived from milk) that has been show in many scientific and clinical studies to remineralise decayed teeth by replenishing lost calcium and phosphate. Further, It is easier to think about tooth mousse as a topical crémé that is in a sense liquid tooth. Further, this is applied directly onto the surface of the teeth and it is able to microscopically allow for calcium and phosphate to help rebuild or remineralise the tooth. If you wish for more information on dental prevention or if you have any dental queries please do not hesitate to contact Skygate Dental today on (07) 3114 1199 or 0406 579 197.